TT #105 Dash Air Issues Resolved - Finally!! Sometimes taking a different approach to solving an issue yields results that have eluded those using traditional approaches. 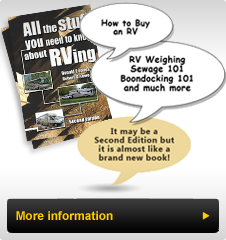 This Tech Tip details a story of an ongoing issue that finally was resolved by taking a different approach to RV repairs. We have a 2009 American Coach that was built in February 2007; we purchased it new in September 2010. During our roughly eight years of ownership we have experienced several "no cooling” issues with the dash air conditioning. Before continuing, I should mention that I am a strong believer of using the roof mounted air conditioners to cool the coach when driving in warm weather. This coach has roof mounted AC grilles alternating with return air intake vents mounted in rows parallel to the sidewalls centered about fifteen inches (15” or 38cm) from the sidewalls. The coach has two 13 foot (4m) long, 30 inch (76cm) deep slideouts immediately behind the drivers and passenger seats. With this configuration, those AC vents blow cool air down on top of the slideouts only to have it sucked up into the return vents immediately, then it repeats the process. Due to this, the air does not blow into the passenger area. Thus, we are dependent on the engine driven air conditioner while driving. Being "northerners” we do not need the air conditioning as much as those who frequently travelling in the south. We have had the system serviced for no cooling roughly every year or two (1-2) years. Each time a new "leak” was blamed: The low-pressure valve connection (where the hose to measure the low pressure is connected), the receiver dryer (contaminated), no specific leak found however it needed recharging and so on. In recent years, the system was recharged with R134A containing UV dye to make it easier to locate a refrigerant leak. Over the last three years I have taken to topping the system up myself with a quality, refrigerant containing UV dye. When it was not cooling once again this Spring, I decided that it was time to have someone other than RV Service Shop technicians look at it, since the failures were more frequent and doing the same thing year over year was truly insane! We contacted Country Air & Repair (http://www.countryair.ca/) located in Moorefield, Ontario, about two hours from our home. The owners, Chris and Josh are truly mobile AC specialists. You can read about their qualifications on their website. In their repair shop they frequently do the work themselves, which further adds to the value. Their business has grown from repairs to mobile air conditioning systems in their shop to a booming wholesale parts business serving the whole country. They supply many other shops and dealers with original AC system equipment or excellent replacements, even including the ability to custom making all the hoses and designing a replacement system when parts are no longer available. I took our coach into their shop during one of the year’s hottest extended heat and humidity waves. It had been consistently 34⁰C (93⁰F) or more with humidex readings over 40⁰C (104⁰F). Our coach’s big wide windshield is a big heat trap during this weather. Within ten minutes of pulling it into the service bay and reviewing the service order, Chris, the shop owner confirmed that there was a leak at a rubber hose and its associated metal hose fitting. This hose is one of two running the length of the coach from the rear air conditioning components to the front dash unit. The UV dye added to the R134A made that leak visible using ultraviolet light and special yellow tinted glasses. He then used an electronic leak sniffer to find the exact spot. It’s blinking lights and steady beeping sound made it clear to all. He discovered that the leak resulted from the metal fitting at the rubber hose junction which had never been properly crimped onto the rubber hose. The hose in this area was securely attached to the front of the body firewall and covered by plastic loom so that the friction of the rubber inside the metal fitting sustained the two pieces together, however the pressure could not be maintained over time. When reflecting on the fact that we do not use the air conditioning that often, then you begin to understand why we would get a year or more out of the dash air system before it would leak out the refrigerant at this connection and why we would feel less cold air. Before any further work, Chris confirmed that only R134A refrigerant had been added to the system, explaining that a butane, propane refrigerant mixture is still available in various US states. If this mixed coolant is introduced into the expensive, precision test and vacuum equipment, it damages it making it unusable. (This refrigerant is very flammable and explosive, not something you want in an air conditioning system!) In addition, since he is required to recover the refrigerant, if any contamination enters the recovery container, the complete batch of refrigerant is unusable. Fortunately, he has an electronic tester that can detect the smallest contamination in the system. Using this equipment, he was able to confirm that the system was free of contamination from other gases. After crimping the fitting properly and retesting, he topped up the system. We had cooler air however it was not as cold as expected. His test gauges indicated abnormally high pressures, which signifies that the cooling fan was not coming on to cool the side mounted condenser radiator. The engine was below normal operating temperature and since we have an electronically controlled engine, the hydraulic fan drive engages when a signal is sent from the Engine Control Unit (ECU). This fan rarely comes on at high speed in normal engine operation on this coach. With sufficient air flow from driving, the condenser loses the heat and the cycle can continue. I learned from Spartan Chassis Tech Support, that the fan can be engaged manually going to full speed by disconnecting the electrical connection at the fan drive. With low or no voltage present it is engaged and as the voltage increases the fan slows down, finally freewheeling when 12 or more volts is present. Chris tried a novel approach by spraying the condenser with cold water. Sure enough, the fan engaged however pressures were still higher than expected and cooling was less than optimal. The approach that returned the air conditioning to proper operation, involved removing all the refrigerant, then evacuating the air conditioning system using a vacuum pump for about three (3) hours. This ensured that all refrigerant was removed, along with any potential contamination. While this process was going on, I attempted to get the specifications for the precise amount of R134A that the system held. I called the REV Group (the company now building American Coaches), and left a message, then tried again later and reached a support person who did not have our coach model shown on his chart. However, he had a 2007 Tradition, a similar model to ours, which indicated a system capacity of 6.4 lbs. (2.90 Kg) In the meantime, I called a couple of large US dealers, the largest of which transferred my call to their Tech Support department. This technician said that they usually add 3 lbs. (1.36 Kg) and then optimize the system by reviewing their gauges to finalize the amount. Chris thought the 6.4 pounds (2.90 Kg) was well above what he expected, so this approach melded with his expectations. (The original call was returned about an hour later indicating that the system required 6.3 lbs. (2.86kg)). This call came just after Chris had the system operating correctly with 3 pounds (1.36Kg) of R134A. The radiator fan was responding as expected and the dash air temperature was cold: -12⁰ to -16⁰C (10 to 3⁰F) measured at the dash air outlet. When the engine cooling fan was operating and the engine on fast idle, the indicated engine temperature was about 180⁰F (82⁰C) as shown on the dash temperature gauge, less than the usual 195⁰F (90⁰C). We declared the repair a success and I drove the coach home in about 1.5 hours, with the air conditioning on full cold. Water was draining below the coach when we started (at the shop) and was still dripping while I was parking it. On the next trip, the interior temperature was comfortable with the fan blower set to low speed in 27⁰C (80⁰F) weather. This replicated driving in our car and was rare in all the years we have driven this coach. Overall, the strength of having a knowledgeable, mobile Air Conditioning specialist examine the system and know what to look for, going above and beyond the usual parts replacement, made the service experience one that produced the repair that, I believe, finally fixed our system. While time will tell, I am confident that the niggling issue for the last eight years has been corrected. For those reading this TechTip that are within driving distance and having trouble with their RV dash air conditioning system, I highly recommend Country Air. Everyone can benefit from taking a step back as I did and looking for another approach with a system specialist, in dealing with an ongoing, unresolved issue.